Swamp Rock is a term coined by producer Jerry Wexler in the late 1960s to describe the sound of records made by Creedence Clearwater Revival (Bayou Country, 1969) and Louisiana-born singer/songwriter Tony Joe White (“Polk Salad Annie,” also 1969). Swamp rock is the musical equivalent of the literary genre known as “local color,” and while it isn’t generally considered an instance of so-called Swamp Rock, the popularity of this particular musical form was jump-started by Bobbie Gentry’s huge hit “Ode to Billie Joe,” a Number 1 single released in 1967. In fact, Gentry’s debut album, Ode to Billie Joe, knocked the Beatles’ Sgt. Pepper’s Lonely Hearts Club Band from the top of charts in the late summer of 1967. 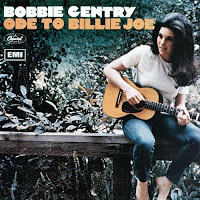 (Incidentally, as an instance of local color, I think it’s arguable that Jeannie C. Riley’s 1968 smash hit, “Harper Valley PTA” profited greatly by the success of “Ode to Billie Joe.”) Coincidentally released at about the same as the “The Golliwogs” were reinventing themselves as Creedence Clearwater Revival, the musically sparse, lyrically haunting “Ode to Billie Joe,” often considered an example of “Southern Gothic” and not Swamp Rock, sounded “down-home”—and therefore authentic. Hence Swamp Rock, characterized by a heavy, fluid bass and distorted reverb guitar, was perceived to have actually emerged from the Louisiana bayous (the inspiration for the term), as CCR’s “Born on the Bayou” (1969) suggests. Since the lyrical content of the music often spoke to backwoods, rural experience and relied heavily on colloquial expression and local idioms—Tony Joe White actually was from Louisiana and his thick Southern accent was immediately noticeable—it was therefore considered “authentic.” However, since Creedence Clearwater Revival was from the Bay Area of San Francisco and not from the Louisiana bayou country, Swamp Rock may be considered an instance of the way the perception of authenticity can legitimize a certain form of popular music, and hence raise its cultural cachet in the marketplace. Just as the Beatles’ “Oh! Darling” (from Abbey Road) was initially believed to have been recorded by a local band by “Swamp pop” enthusiasts in the New Orleans area, so, too, could CCR’s John Fogerty sound convincingly Southern.